Mikhail Nesterov – one of the participants of the association of traveling exhibitions. Coming from a merchant family, from childhood he abhorred all kinds of trade. The young man occupied art and literature. Fortunately, his father was also interested in art and therefore took an active part in the fate of his son, supported all his endeavors. Michael’s childhood was calm, imbued with love, which later had a great influence on all his work. The artist’s paintings are often majestic and represent traditional values. However, not everything was so smooth in the fate of the author. The death of a young wife during childbirth was an event that changed his life. The artist reflected the image of his beloved wife in many paintings after her death. Glorified the artist paintings on religious themes. However, in the depiction of landscapes Nesterov was a master. He said about himself that he did not like to portray strong passions. In the image of a calm, majestic nature, the artist found a kind of outlet. The soft, unobtrusive beauty of his work is the best suited for displaying the nature of central Russia. 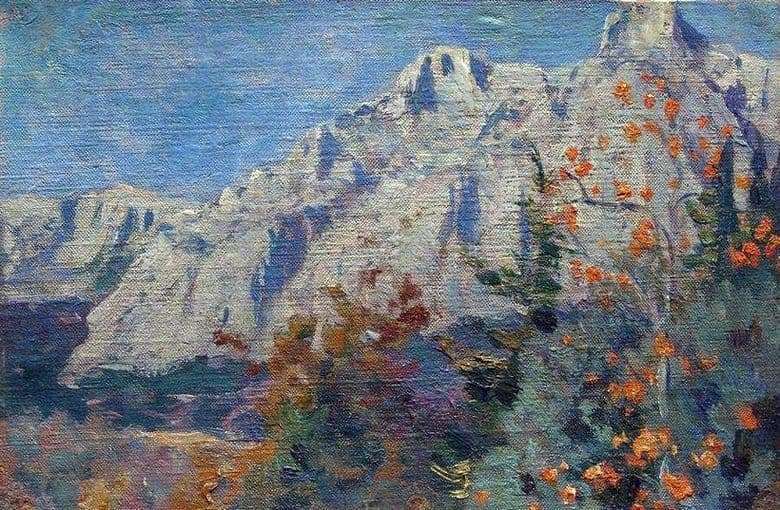 The painting “Mountains” is written in a typical artist’s style – without bright colors, with smooth transitions from one color to another, with a play of semitones. Blue sky with small clouds soars high above the tops of the mountains. The mountains themselves, white and blue, harmonize with the tone of the sky, and with the blue-green tint of foliage, connecting the two planes of the painting – the sky and the earth. The only bright spot in the picture is a thin birch in the foreground. Her yellowed foliage, written in gentle, precise strokes, attracts the viewer’s gaze.